Metal box approximately 11 x 8 x 2.5cm. 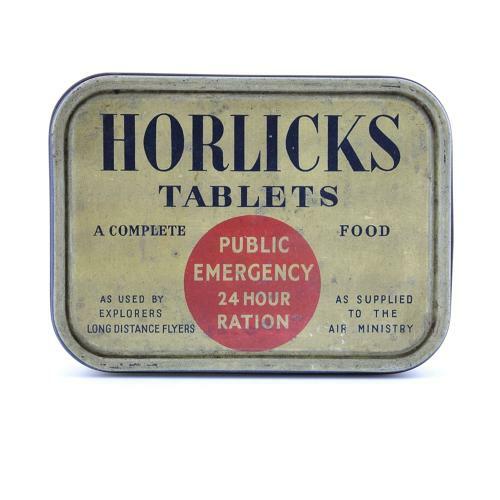 Printed on the lid 'Horlicks Tablets - A Complete Food - 24 Hour Ration - As Used By Explorers, Long Distance Flyers - As Supplied To The Air Ministry'. It is interesting to note that at least two slightly differing versions of this tin exist, each with alternative text. This is the rarer of them, 'Public Emergency 24 Hour Ration' and is complete with the original tablets and inner wrapper (1 tablet missing/eaten? ), all seemingly in very good condition. The tin itself has minor age related wear but is in good to very good overall condition. These rations were issued as part of some of the RAF survival packs during WW2. Not for use or consumption. Stock code S22395.